Mortgage rose slightly higher this week. NEW YORK (CNNMoney) -- Rates on 30-year fixed mortgages climbed slightly higher this week, breaking a run that saw rates match or set new record lows for 13 out of the past 14 weeks. 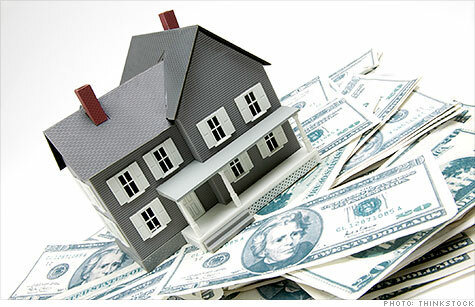 The rate on 30-year fixed mortgages rose to 3.55% from 3.49% last week, Freddie Mac said in its weekly report. Last year at this time, the mortgage rate averaged 4.39%. Meanwhile, the 15-year fixed-rate mortgage -- popular among those seeking to refinance -- also inched slightly higher to 2.83% from 2.80%. Last year, it averaged 3.54%. The increase in rates followed several positive economic announcements, including debt relief efforts in the Europe, an increase in U.S. consumer confidence in July and a report indicating that home prices are on the rise, according to Frank Nothaft, Freddie's chief economist. "Recent announcements of additional debt relief for the Eurozone and mixed domestic economic indicators added upward pressure on Treasury yields as well as mortgage rates this week," he said. Mortgage rates tend to track yields on Treasurys, which also climbed slightly higher this week. Nothaft also pointed out that while there was a mixed bag of housing news -- including a disappointing report on pending home sales in June -- home prices are on the upswing again. In May, home prices climbed for the fourth consecutive month, according to the S&P Case-Shiller 20-city home-price index. Even though rates and home prices have climbed higher, buying a home still remains extremely cheap. A $200,000, 30-year fixed-rate mortgage costs just $904 a month, compared with the $1,013 it would cost a year ago, when rates averaged 4.4%. Five years ago, that same mortgage would have carried an average rate of 6.5% and cost $1,264 a month. "[This week's increase] is more likely to be a temporary retreat than a lasting turn," he said. "Mortgage rates will stay very low given the ongoing uncertainties surrounding the economy, fiscal cliff, and European debt circus."